Isabella our 4 months old baby girl brings joy and happiness to anyone surrounding her! She is only 4 months old with a personally of a 1 year old . She's just laughs and smiles all day long. Bella loves the camera and the camera loves her. Everyone meet out little princess Isabella. Emily and Aaron congrats on your adorable baby girl Isabella! She's a cutie!! God bless all of you!! P. S. Look at that smiiiile!! Too cute!! Isabella is a adorable little four month old girl who just bring love and joy to anyone around her . She's just so loveable and playful. She just the cutest little thing . Such a cute n happy baby.....congrats again!! 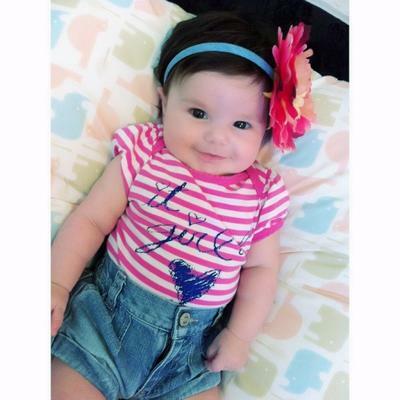 Baby Isabella is all about laughing and taking pictures , you could tell she just loves it ! 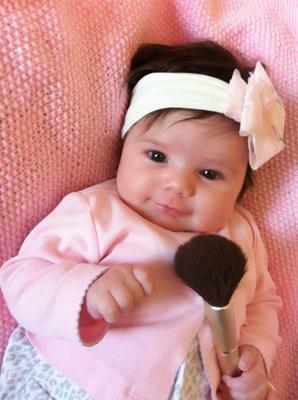 She is the most precious baby <3 love her !! Isabella is my world and princess ! Hope you all enjoy her photos. Plenty of more to come . Xox thanks everyone ! Bella ! The name stands for its self .she loves the camera always with the cutest smile you ever seen. I seen Isabella for the first time on Saturday and she was so cute and smiling, never heard her cry once. Isabella is so adorable she melts your heart every time you see her I just love her so much and I'm so proud to be her godmother. Isabella is daddy's little girl , she's my princess and my whole world. Such an amazing little girl my cousin had :) she's such a sweet little cuddler! I've know Aron for a while and Hese always been a super joyful and generous person . We lost connection for a while but when we reconnected I noticed he seemed happier and more complete then ever . Soon enough the good news was revealed to me and I found out he and Emily were blessed with there angel of a daughter Isabella . He showed me a picture and all I could say was shes adorable congrats. I was happy to see all of this joy . She's is truly a masterpiece made by Aron and Emily . When around her I've yet to hear her cry but always see a smile and hear soft laughters . She's is truly a wonderful little girl to this perfect couple . She's has an abundant ammount of potential ahead of her because of her great parents and the support she will have behind her. Best and strongest positive vibes from me to the three of you . All the best .